Summer is right around the corner and it’s BBQ time! 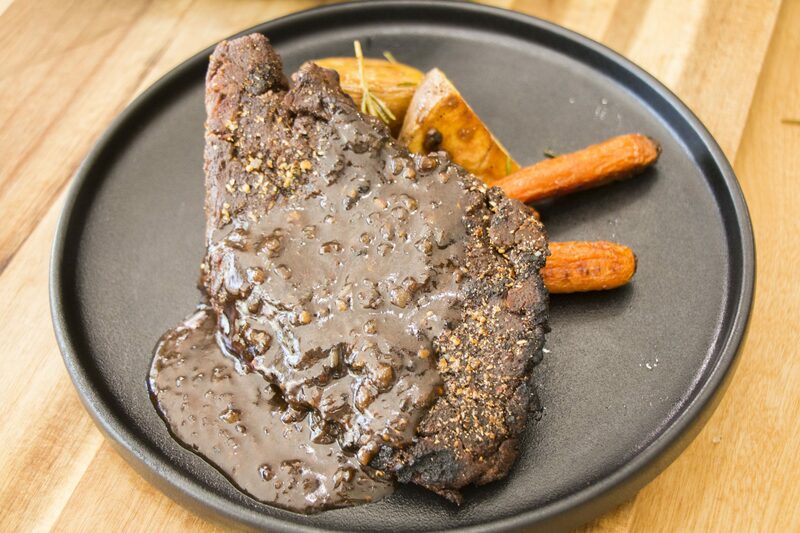 Convince the most stubborn non-vegan guest with this Vegan Seitan Steak, served with a delicious peppercorn sauce. The liquid smoke, which you can easily find in any grocery store, will enhance that beloved taste of cooked on the grill. The condiment Kitchen Bouquet will not only enhance the flavor of the steak spices but will also add a nice color to your vegan steak. But the key ingredient is Vital Gluten Wheat*. Throw in some grilled roots vegetables, such as potatoes and carrots, and you’ve got yourself the perfect summer dinner. Cheers! *Vital wheat gluten and gluten flour, also sometimes simply called wheat gluten, refer to the same thing: an extraction of the protein in wheat flour. When mixed with water or broth and spices, makes seitan, a vegan “meat” that is rich in protein. Wheat gluten is an alternative to soy-based foods such as tofu or tempeh which are sometimes used as meat substitutes. Wheat gluten is often used in Asian, vegetarian, vegan, and Buddhist cuisine. In a large bowl, whisk together soy sauce, maple syrup, liquid smoke, Dijon mustard, miso, HOT vegetable broth and Kitchen Bouquet seasoning. (It’s important to use hot vegetable broth). Set aside. In a food processor, mix together the vital wheat flour, onion powder, garlic powder, chickpea flour and canned lentils. Add the wet ingredients to the dry ingredients in the blender and process for 2 to 3 minutes. Place the dough on a clean work surface. Knead for 2 to 3 minutes adding gluten flour if necessary. Gently stretch your dough and separate into four pieces (4 steaks). Steam for 15 to 20 minutes then flip the steaks and steam for another 15 to 20 minutes. Refrigerate for at least 1 hour or overnight to allow the steaks to firm up. Make the sauce: In another pan, sauté the shallots in oil for 2 to 3 minutes.Add the brandy and flambé (optional). Whisk in maple syrup, worcestershire sauce, ground peppercorn, Dijon mustard, Kitchen bouquet seasoning, vegetable broth and non-dairy cream. Let the sauce reduce to thicken over medium-high heat. When the sauce has thickens, add salt if necessary. (You can also make a cornstarch slurry)*. Brush the steaks with oil on both sides and sprinkle generously with steak spices one one side. Place the steaks on a hot grill. Cook for 2 to 3 minutes on each side until grill marks appear on each side. Do not over cook as the steaks are already cooked. ( you can also pan-fry it). Seitan steak was very good! I put the 2 tbs Kitchen Bouquet in the seitan so my sauce was white, should it be divided between the two or are we missing it from the sauce ingredients. It’s 2 tbsp for the seitan and more for the sauce, I’ll change it thank you !! I can’t find the Belsoy cream … is there a substitute? You can find it pretty much everywhere nowadays but if yip can’t you might try full fat coconut milk. Hello Love you videos Thank you for doing them has helped me in the kitchen sooo much I don’t know how many times I have made your version banana bread tastes awesome. In Regards to the Brandy in this sauce can it be omitted and something else be added instead? Thanks, you can use apple juice instead! You’re the BEST! Thank you for sharing your story and inviting us all for the journey!!!! Hello! When you list “miso” in the ingredients are you referring to miso paste OR miso powder? And approximately how much steak seasoning? I’d rather use too much than not enough? The secret is to use a lot! Lol got it!!!! Thank you!!!!! How do you steam your pieces : do wrap them in tinfoil or just put them in a steamer basket as is? You can put them as is! This was delicious! The steak and sauce are both incredible. I used regular flour instead of chickpea flour, skipped the brandy, and used Silk soy creamer. Thank you so much for this wonderful recipe! I can’t wait to try this recipe!!!!! Can the “steaks” be frozen? OMFG , the best. The steak and the sauce are amazing. My flambe came out chunky and sweet, but it was still amazing. I’ve only made the sauce once, but I make the 4 steaks every week and it feeds our family of three all week. I don’t use the browning sauce, sometimes don’t use miso, and replaced lentils with black beans (all depends on availability where I’m traveling) and now I don’t even use the black beans. The best I’ve had it is exactly as he’s made it. It slices fajita thin and goes great in everything I’ve put it in. I’ve dredged it and deep fried it, lined them up in sandwiches, slapped them shits in a burrito with tater tots and balsamic brown sugar glaze, paired it with some crispy potatoes or mashed potatoes, and even shaped them into steak burgers before steaming so we weren’t left out at a family barbecue. Thanks, BC. Miso paste. It’s about 4 bucks a tub. I coat the whole thing, basically dredge the whole steak in McCormick Grillmates Roasted Garlic and Herb and it’s fantastic. I made this over the weekend and they’re incredible! I’ve got 2 left and was thinking of making Philly steak sandwiches. Anybody have a recipe for some melty cheese? Is there a substitute for browning sauce? I haven’t seen it here in NZ. I live in a small town. How can l get wheat gluten or seitan? You can get it online on Amazon for example!